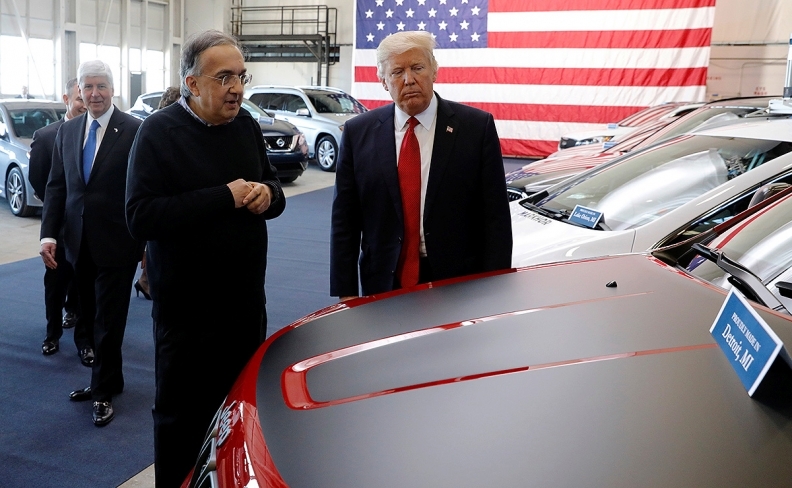 Sergio Marchionne with President Donald Trump at an event in Michigan last year. Following reports of the death of longtime Fiat Chrysler CEO Sergio Marchionne, auto industry leaders recall the entrepreneur's uncanny mindset and his role in transforming the industry. Marchionne was 66. New FCA CEO Mike Manley, during the automaker's second-quarter conference call: "This morning's news is heartbreaking. ... There is no doubt that Sergio was a very special unique man and there is no doubt that he's going to be sorely missed." Ford Executive Chairman Bill Ford: "Sergio Marchionne was one of the most respected leaders in the industry whose creativity and bold determination helped to restore Chrysler to financial health and grow Fiat Chrysler into a profitable global automaker. His extraordinary leadership, candor and passion for the industry will be missed by everyone who knew him. Our thoughts and prayers go out to his family at this difficult time." General Motors CEO Mary Barra: "We at General Motors offer our condolences to Sergio Marchionne's family and friends. Sergio created a remarkable legacy in the automotive industry. Our thoughts are also with our industry colleagues at Fiat Chrysler as they deal with this sudden loss." Daimler AG CEO Dieter Zetsche, who once ran Chrysler, tweeted: "The auto industry has lost a real giant." NADA Chairman and FCA dealer Wes Lutz: “NADA is deeply saddened to learn of the tragic passing of Sergio Marchionne. Marchionne was a force of nature and a true visionary within our industry. GM CFO Chuck Stevens: "We're all saddened by the news this morning on Sergio Marchionne's passing. We had a deep amount of respect for Sergio and what he's met for the industry." Carlos Ghosn, Renault-Nissan-Mitsubishi: "Our entire team at Renault-Nissan-Mitsubishi were saddened to learn of the death of Sergio Marchionne. At this difficult time, we would like to express our sympathies to the Marchionne family, to our colleagues at Fiat Chrysler, Ferrari and CNH Industrial." Aston Martin CEO Andy Palmer: “We are deeply saddened to learn of the passing of Sergio Marchionne. On behalf of all of us at Aston Martin Lagonda, @astonmartin I would like to extend our sincere sympathies and condolences to his family, friends and colleagues at Fiat Chrysler Automobiles @fiat." Jerry Dias, president of Canada's Unifor union: "Sad news this morning on the loss of #SergioMarchionne at the age of 66. Sergio was a true visionary who leaves behind a strong legacy @fcagroup. My condolences to his family, friends and colleagues." UAW President Gary Jones: “During the industry’s dark days of the recession, Chrysler, Dodge, Jeep and RAM were at a perilous point. Working with the UAW members, the FCA rebirth was borne when many doubted it would come. As in all labor-management relationships, there were clashes and disagreements. UAW Vice President Cindy Estrada, vice president of the FCA department: “UAW FCA members recognize that Sergio Marchionne helped build a growing company that provides job stability and certainty for their families every day. The New York Stock Exchange: "We mourn the passing of auto industry legend Sergio Marchionne. He helped multiple companies (Fiat Chrysler, Ferrari, CNH Industrial) tap the public markets, creating thousands of jobs across the globe. Here he is pictured in 2015, the day he took Ferrari public. #RIPSergio"